So it has come to my attention – like a sledge hammer to a walnut – that maybe, just maybe there is such a thing as too much. The fact that a bunch of my clothes in my closet are mocking me and that muffin-top has become a resident are reasons enough to make changes. Somehow the “treating myself” has become a not-to-desirable habit. Over time, the start of the week-end went from Friday to Thursday to Wednesday to, let’s just call it like it is: EVERY day had become the week-end! Before kids I could eat whatever I wanted and never gain an ounce. Of course I did lots of sports in high school and college. I didn’t know what the word diet was, except as something Mom would try (and there were quite a few)! Then I had a sedentary boyfriend (read computer geek who was not athletic – yet who has become so!) After that relationship, I met my hubby and quickly had kids (3 in 4 years and yes, it is not an excuse) and even though you are running around with them, there are still lots of times where, well, you’re not. Things happen in life and you I turn to food for comfort: when happy, when mad, when sad, not even realising that’s what I’m doing. Or, absent-mindly eating the whole mega-sized bag of chips just because they are there – like an alcoholic must see the bottom of the bottle, I must see the bottom of the bag! For a while, one can get away with it: there are no obvious ill-effects of those extra glasses of wine (or beer, or margarita) and those bottomless bags of chips, and pasta – did I mention that I LOVE to cook? Yeah. Mostly I make healthy stuff but sometimes it’s not necessarily low-fat and always in quantity to not lack. Well, after a while, the next thing you know is, clothes are snug!! So, when one sister joined Weight Watchers, the second and I followed her plan. Excellent! 30 pounds lighter and life is good! It was great as the three sisters were encouraging each other and counting points together and whatnot. Till we didn’t. You see, weight gain can be so insidious… And all that good behaviour slowly goes out the door if you don’t pay attention…. Next thing you know, I’m once again 20 pounds up. So, when I turned 46, my gift from me to me with all my love was to sign up with WW and start Kyokushin karate (as my sons were already doing). 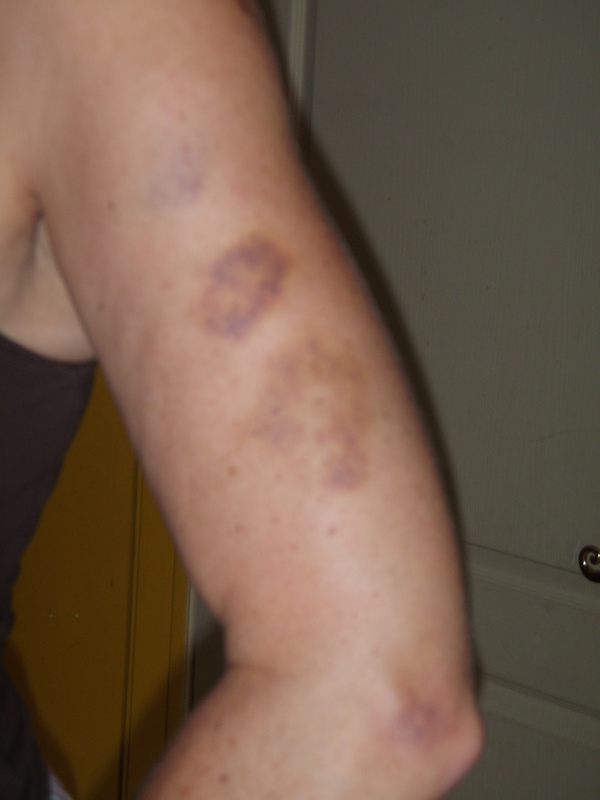 Yes, I did accumulate some very interesting bruising (it is a very tough version of karate!) but I also shed 20 pounds! Woo hoo! Well, dammit. I was planning on being “Fabulous at Fifty” and was working out, eating well, cutting back on the booze, but during a workout in January I hurt my foot and my shoulder was not getting any better. No more karate or Befit for now. Guess what? Yeah, you guessed it. I’m back up where I swore I would never be again!!! My only exercise is walking my dog for six to ten kilometres per most days. This is definitely worth something but nothing to balance out the daily glass of wine or two and bowl of pasta and muffins and, and, and…. Just because I was not where I had hoped to be ON my birthday, doesn’t mean that during the year I can’t reach it, right? So, along with my new Sunday Gratitude ritual, I also decided that my body is extremely important to me if I want it to run smoothly for the next fifty years so I had better give it more love. No,NO, NOT more muffins and pasta and wine! More proper nutrition and exercise ! (So I will stop putzing around and go and get new orthotics for my shoes as my feet can’t take it any more!) Also, more soul-satisfying activities (meditation, tea time, reading for pleasure time, whatever else makes my soul feel good). This is the type of meal I am now enjoying (OK, OK, I always enjoyed these types meals!) while keeping away from that nasty sugar that I’m addicted to! I am on a mission to make the necessary changes to my lifestyle to be around for a long, healthy time! And writing it down here for you all to see puts me in quite the pickle should I fall off the wagon! 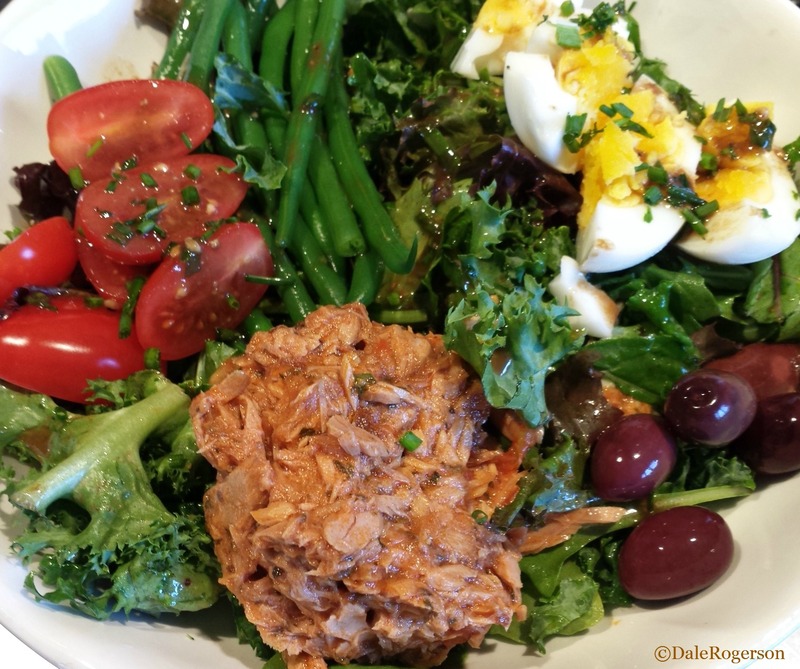 This entry was posted in Well-being and tagged Good health, kyokushin karate, muffin top, niçoise salad, soul, Weight Watchers. Bookmark the permalink. I like to swim, have done so since I was four, and it is a great exercise without the high risk of injuries…. True. But I don’t like public pools and that would be my only option in the fall/winter/spring! Ha! Ha! My sisters and I think we need someone to do like we do to our cats and dogs when they are overweight. Sorry, Bud, you only get one cup of food today, you big fatty! Duct tape… yep.